Founded in 1907 by Herman Flamig who was Nevin’s Great Grandfather and a German immigrant, Flamig Farm has survived being (among other things) a 12 cow dairy, an egg retailer with a few thousand producing chickens, a top soil mining operation, a snow plowing service and an organic vegetable farm with 10 cultivated acres. At one time, Flamig Farm had three teams of draft horses and did lots of individual and customized hayrides as well as carriage rides for weddings. 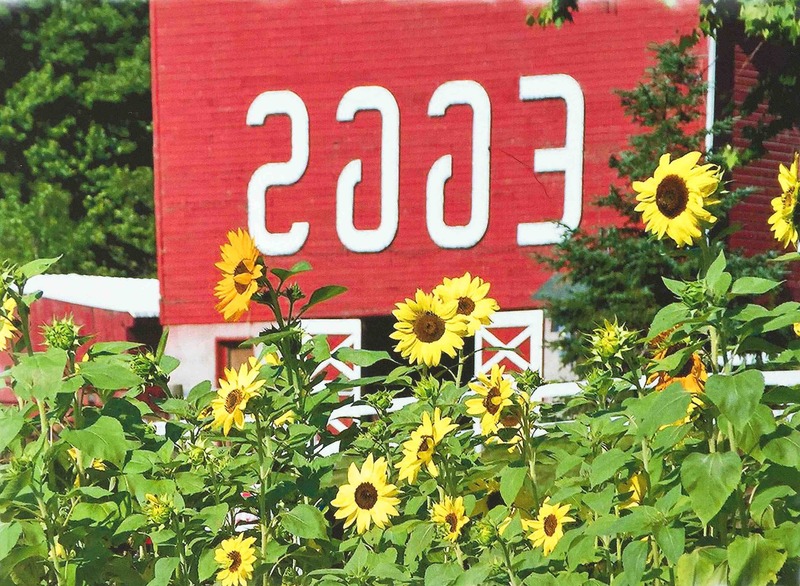 One part of our history often comes up when people wonder about the big backwards EGGS sign on our barn. Well, years ago, an artist friend of ours told us he wanted to put something on the end of our chicken barn. That sounded interesting but we were really too busy at the time to pay much attention to what he was doing, and before long he invited us to the Farm workshop to show us what he had created. We found 4 huge 8 foot tall letters that said EGGS. We knew zoning would not let us put up an advertising sign that big. Finally someone said, “Let’s put it up backward and call it “ART.” And so we did. Zoning did come out but they must have agreed it was art, and the sign has been there ever since. The Flamig Farm mission is to be the premier demonstration and education center in New England, focusing on local food production, energy conservation and efficient energy production, and personal wellness and nutrition. Flamig Farm is and will continue to expand as a resource for information inspiration and consultation, striving to encourage all who visit to take greater responsibility for personal and community well being while having good old-fashion fun. Flamig Farm is poised to take a leap into the future and realize its potential to become a major source of information and inspiration. We hope to present a vision of the future which outlines a pathway toward becoming a center for demonstration and education in the context of vital human systems, particularly food, energy and health. One of the things we have grown, raised and cultivated at Flamig Farm over the years is optimism. We believe that positive thinking brings positive things to our environment, to our activities and projects, to our animals, to those of us who live and work here, and, of course, to you, our Farm guests. We believe that you too can enjoy the satisfaction and happiness that comes from sharing our positive vision. Even a short visit to our Petting Zoo can relieve stress and bring smiles. Larger doses of feeling good come from exploring life on our Farm and learning at Flamig about the myriad of gifts our earth provides. An artist friend of ours told us he wanted to put something on the end of our chicken barn. We were too busy to really pay attention to what he was doing. He invited us to the wood working shop to show us what he had created and we found a huge sign that said EGGS. We knew zoning would not let us put up a sign that big, we told him that, and he and everyone got a bit upset. Finally someone asked “What if we put it up backwards and call it “ART”. And so we did…..
Flamig Farm has been in the family since 1907 and has been through many transitions. 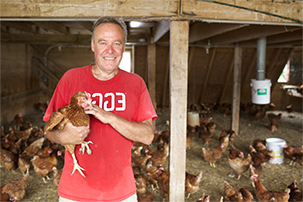 During it's 100 plus years the farm has gone from a 12 cow dairy, to a few thousand chickens for egg production and through a time of growing 10 acres of organic vegetables. We once had 3 teams of draft horses and did lots of hayrides as well as carriage rides for weddings. As you explore the website you’ll get a good understanding of what we are doing today. Many today would describe our world as turbulent. We believe that everything is connected and everything is heading toward the best possible outcome. "Turbulence is causing Transition to Triumph". We need to look "beyond the obvious" of daily input of bad news from around the world. When right places you will see wonderful people working on issues and coming up with incredible solutions to what many people would call problems. The word "problem" is no longer part of the Flamig Farm vocabulary. What used to be called problems have become situations, challenges or opportunities. We Dream of changing the world! We hope to present a vision for the future which demonstrates and educates people about how we can live more harmoniously with nature here on Mother Earth. This includes local food production, energy production, health and wellness and community well-being. Now let's get going and have some fun!